With the i-STAT, Relaymed is the total lab connectivity solution. Relaymed is the first affordable, automated POC connectivity software solution for the physician office laboratory to interface the Abbott i-STAT. Now you can ensure your practice gets real-time results into the EHR. No longer do Abbott i-STAT clients in primary care have to pay over the odds for a complex data management software system, not suited for their needs. And you definitely do not need a laboratory information system! Relaymed is designed specifically for primary care, streamlined with the features you need. This is an interface we’re very proud of, as truly means Relaymed is the total lab connectivity solution with the extensive test menu the i-STAT brings to the point of care. See our complete list of compatible devices here. The i-STAT system accelerates the patient care decision-making process. Results pass through the Abbott i-STAT within 2-minutes, allowing for instant critical decision-making capability at the point of care. And now Relaymed ensures these are instantly available where they are needed — in the EHR. Relaymed ensures the right data, in the right place, at the right time. For the interface to work, you need to have the Abbott DE software installed — just contact your Abbott Point of Care representative for this. Step 1: connect the i-STAT to your PC or server, either via wireless or the i-STAT Downloader. Relaymed will automatically transfer test results to your EHR. Instantly. That’s it! It’s that simple, really. 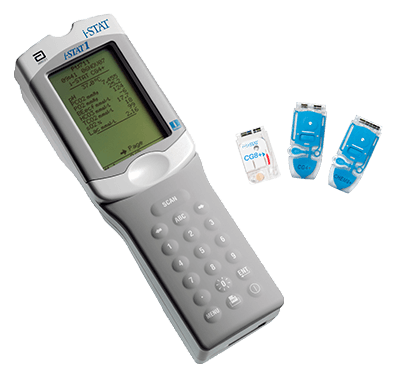 Like to learn more about our interface with the i-STAT? Request a demo today and you could be saving time and improving patient care within days.